This is nothing new. Multiple animals have been treated to this type of abuse. One of the worse holidays that supports this action is Easter. Can you believe it? 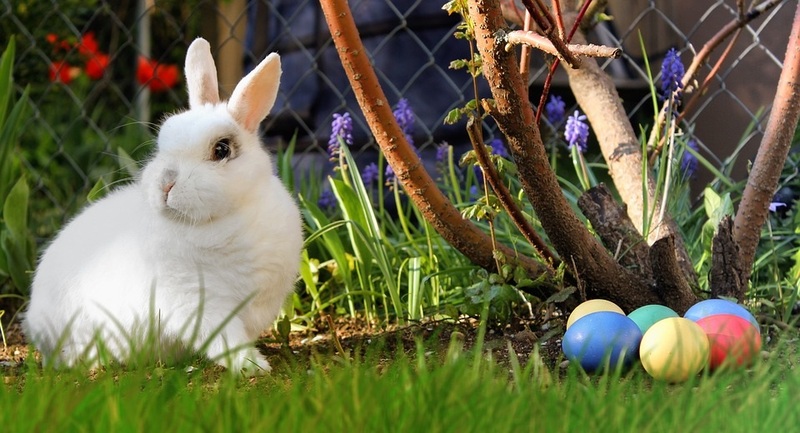 A day to celebrate the resurrection of Jesus Christ is also a day that haunts little animals to the point of death. You must think this is crazy but, it's true. Easter is also celebrated on the first Sunday after the first full moon following the northern spring equinox. That means babies. Lots and lots of babies. Thanks to commercial society, chocolate and candy companies morphed Easter into a production day for their increased sales. This is how Easter egg hunts became so popular. So why eggs? Well... because it's spring. Ducklings and Bunnies. Bunnies hide the colored eggs filled with chocolates. Thanks Easter Bunny! A popular pastime for the rich and oblivious people, is to buy their children babies: baby ducks, baby chicks, and baby bunnies but, what happens when Easter ends and the animals grow up? The animals usually get abused and abandoned. This spur of the moment activity also leads to uneducated people to get animals they don't know how to take care of. This is a personal story of mine as it happened to someone I knew. I was looking at Snapchat stories (Social Media) and came across this girl who found a duckling. I don't know where she found it or if she stole it but she didn't know anything about ducklings. I contacted her and told her if she had any questions to let me know. I also made sure to have her understand what the duckling needs were. I told her that I would gladly take in the duckling if she didn't want it (I had my own duck at the time named Dumpling, I found abandoned and raised). I warned her. I told her the first thing she needed to do was get a heat lamp. Make sure the baby wasn't to cold. The mother was the source of heat for the baby and without the other the heat needed to be reconstructed. I told her she could give some veggies (like greens) to the duckling until she could get some proper food for the little guy. I continued to monitor her story as I admit I wanted a new duck to befriend my duck. 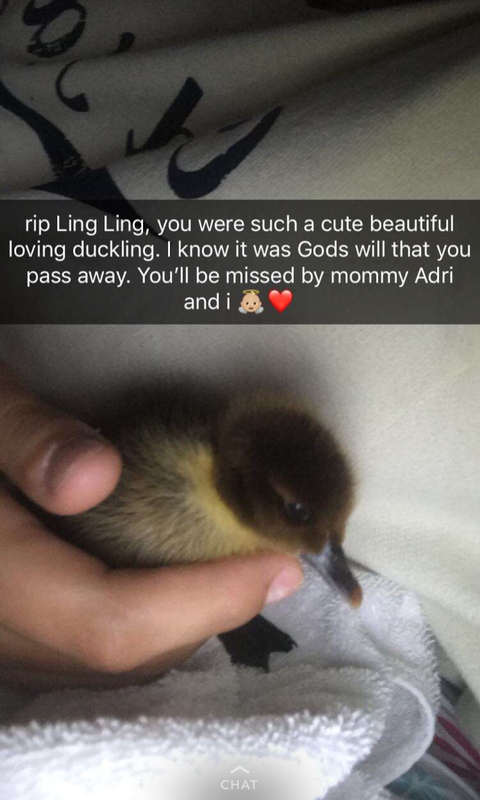 She named the duck ling ling and it seemed she really cared for the duck but, as you read the title you know how this story goes. She was heartbroken. The little duckling kept waking her up at night. She told me she held it for a few hours. In the morning I was bombarded with messages from the girl and videos of how the duckling was wobbly and kept body his head. Just what I expected. A house is usually at 75 Degrees. 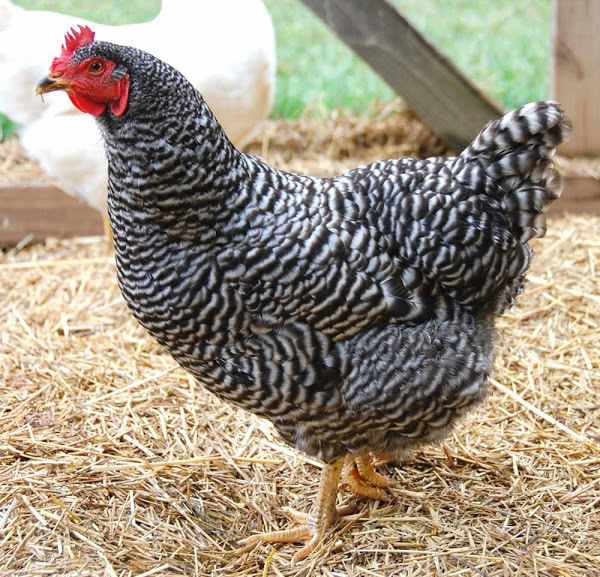 A brooder (A place to raise baby poultry) is suppose to be at 95 Degrees for new babies. I told her the truth. He's in shock. His whole body is going into shutdown. His feet are cold. They're suppose to be warm. His organs are shutting down. She didn't text me back. Two hours later, I got a message. "He died in my hands." I was sad. I blamed her. I could have had that duck. He could have grown up and lived with my duck. I quickly thought to myself. "She's grieving too". I have had a few hens die on me and I immediately felt her pain. It died in her hands. I tried to give her relief. I told her she did all she could do. Which was true. She told me it was all her fault. Which was true but, she didn't know. I tried to explain that to her. I tried to take on the blame of the death of the duck. To carry the burden so other wouldn't have to.